I know we’ve been kind of silent the last two weeks. SA is finishing up finals for her first year of university; KM just started a wonderful job at a library. We’re not going anywhere! We’ll be posting a review tomorrow and should be back on schedule next week. In the meantime, we do have something to share with you: our next Kniterary Afghan block! The Kniterary Afghan is a project we introduced a few weeks ago; it’s a knit blanket made entirely out of knit book covers. Today’s block comes from a book we reviewed a few weeks ago. It’s been our most popular review and it has a lovely cover, so we couldn’t wait to add it to our blanket. 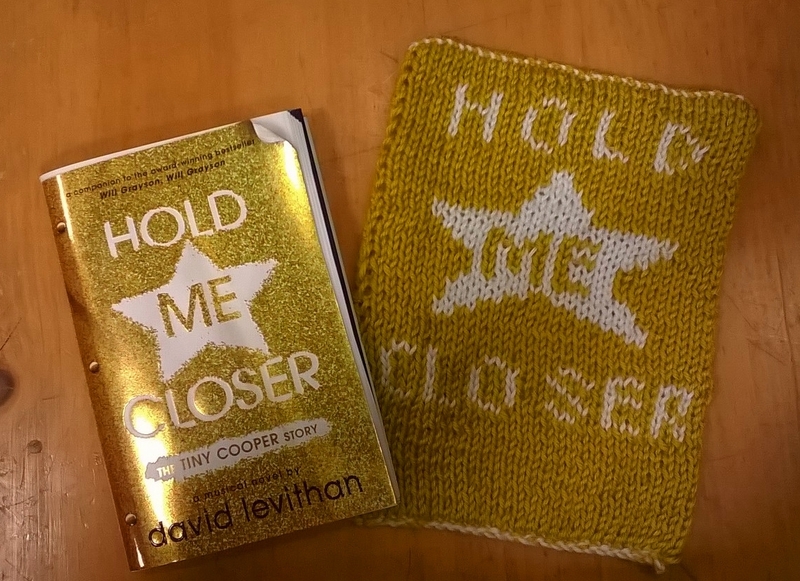 It’s Hold Me Closer by David Levithan! You can download the pattern for this block here: HMCDoc. Get ready to sing! Tiny Cooper, the not-so-tiny and incredibly gay teenager who stole our hearts in Will Grayson, Will Grayson (David Levithan and John Green, 2010) is back, and this time… it’s musical. A companion piece to Will Grayson, this fabulous book brings to life the play Tiny has spent his life writing, filled with song, heartfelt truths, and intricate choreography. And the ghost of Oscar Wilde is there too. I will start right here by saying that your probably have to have read WGWG before reading Hold Me Closer to really enjoy it. A lot of the themes from the original novel are evoked, and there are many references to events that transpired, and characters we met before. There are also a few inside jokes (if you want to call them that) that will have you laughing out loud… if you’re in on them. So drop what you’re doing and read Will Grayson, Will Grayson, which is also a great book, but I won’t be reviewing that right now. 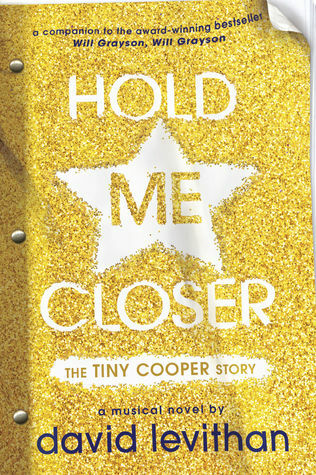 Tiny Cooper is a young gay man with a huge heart and a whole slew of personal questions. Like most teenagers, he struggles with identity and, well, love. He has a whole slew of exes – a chorus of them, actually – and each has something to say about his inadequacies. Or sing. While Tiny shares his life story with us – from birth, to coming out, to his final ex up until now – he also shares with us his hopes, his fears, and the advice he has learned from people around him. The lesson is clear: You must learn to love yourself before you love anyone else. Tiny learns this early on, but takes a while to actually live by it. There are a few amazing quotes which I think are perfect for teens to hear, as it is a lesson for the ages. This gave the book an honest quality to it, a certain reality that made it so approachable. Hold me Closer is an actual script, a functioning script: just add tunes! It would be incredible to see a high school perform it. It’s fun to read the songs and put your own music to them; to imagine the musical in all the glory Tiny would have wanted it to have. The interesting thing is how Tiny speaks to us, the reader, through both his asides to the audience, but also his stage directions. Sometimes you feel a brutal honesty there, as if there is more going on that he would like to let on; it encourages an intimacy with Tiny, a glimpse into his mind, which we wouldn’t have if we were just watching the show. All in all? A perfect companion piece, but also a great play in its own right. Tiny cooper’s story is about as tiny as he is. When reading Will Grayson, Will Grayson, it was Tiny who stole the show, and I’m so glad he finally has his spotlight and time to shine. I want to put this book in the hands of any young teen who passes my way. Hold me closer, Tiny Cooper, and belt your song out for everyone to hear.